MOSCOW, February 25. /TASS/. Although he declared Moscow’s readiness for proportionate response to the United States’ hypothetical deployment of intermediate and shorter range missiles in Eastern Europe in his annual state-of-the-nation address to the Federal Assembly on February 20, Russian President Vladimir Putin did not name any geographic site Russian missiles might be aimed at, Russian presidential spokesman Dmitry Peskov told the media on Monday. "The president said that if our country is under threat and intermediate and shorter range missiles are deployed near its borders, a proportionate response will have to be made and our missiles targeted not only at the launchers, but at the territories where the center of decision-making is located. Please remember that the president did not mention a single geographic name in this connection," Peskov said. In this way replied to a request for commenting on last weekend’s broadcast on the Rossiya-1 television channel in which journalists speculated what targets in the US territory Russian missiles might be targeted at. Peskov refused to make any comments on the content of the broadcast. "We never intervene in the editorial policies of our television channels, even government-run ones, and we cannot do so. In this particular case the question should be addressed to the broadcaster," he added. 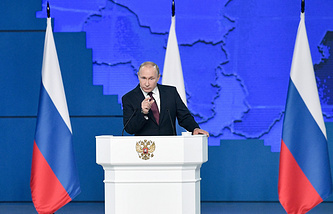 In his annual state-of-the-nation address to the Federal Assembly on February 20 Putin said that Russia would respond instantly as soon as threats against it become real and would target its weapons not only at the countries where the United States would deploy its weapons, but at the territories where the centers of making decisions to use the missile systems threatening Russia were located. Putin said that Russia would resort to proportionate and asymmetrical measures should the United States deploy its intermediate and shorter range missiles in Europe. In particular, he stressed the idea that Russia was not going to be the first to deploy its missiles of this type in Europe.